The only good thing is there seems to be a LOT of vocal critcism about it, so hey! Maybe it'll get changed. I feel attacked by this. I dunno, I think there's a good chance of it being changed since the criticism is pretty unanimous and I'm seeing a lot of similar suggestions as to how to fix it. Revenant had a lot wrong with him on every level since he was a messy concept to begin with like Khora so it's less surprising his #4 made it in since his whole kit is lame. Edit: They could keep the base effect of the 4, get rid of the movement speed reduction, and have the ability have 8 charges. She can then throw her blades and impale a target that then showers everything nearby in blood causing debuffs. As she uses charges the blade cloud loses oomf. Alternatively, unlimited blade works and be done with it. I was picturing Gilgamesh's summoning weapons. But that works too. I mean...I was picturing Gilgamesh's summoning weapons. But that works too. Yeah, either one, they work pretty similarly anyways. Maybe make it so any damage during the cast adds more swords. I've been paring back my hours, but tonight I decided to finally put some forma into Gara. Two forma (plus one more for Corrosive Projection) did the trick well enough. Put Splinter Storm on self and pet (and defense target and maybe allies). Then just bust a Vitrify every 30-40 seconds while running past everything as it dies. It's not very chill because it requires a lot of jumping around while simultaneously watching the ability timer and energy levels and enemy radar, but never having to worry about aiming or firing your weapons kind of makes up for it? It's different, anyway. It might be nice if there was a 5 or 10 second warning sound when an ability like Splinter Storm was about to run out. Or maybe I'm just lazy. I've been using a Sahasa Kubrow since the energy they dig up is handy for Gara. It's also nice for invisible fishing trips with Ivara. That Fetch mod can't come soon enough. This Halloween event is really lame. 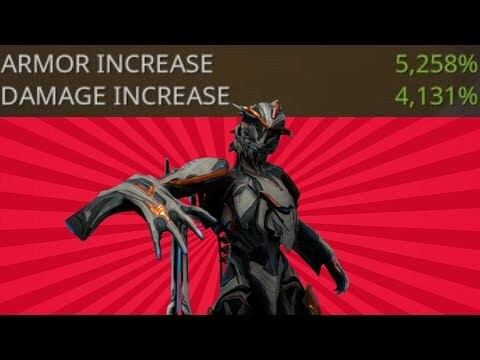 A lot of frames I can figure out while levelling, but I watched a video on how Gara works yesterday and I don't think I would have figured out her synergy of how shattering the #4 with #1 to increase the damage of #2 just by playing on my own even though it is kinda described on the abilities. So I'll probably have to work on getting her tuned up at some point in the future since it looks like a really strong ability, though with lots of micromanagement. It's a returning event, so it was approximately zero work on DE's part to do it again. 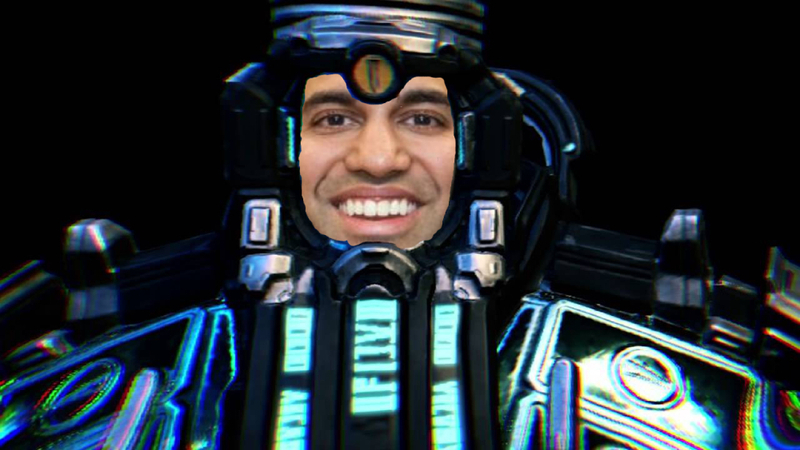 Honestly, I prefer this to nothing, to help kill the time until Fortuna comes around. It took me a while to really figure out what to do with Inaros, as well, apart from the obvious Dessication -> Finishers combo and Sandstorm-ing masses of wimpy stuff. It was starting to click for me hanging out with you guys during the Plague Star reprise but yesterday I was able to pull some kind of action-movie slomo montage during a Sortie mission and tie up a huge number of dudes for the duration of the Mobile Defense ticker while just hammering them with melee. Getting my hands on Negation Swarm was the last piece of the puzzle, I think. I do appreciate the free reactor I got out of it. So I'll probably have to work on getting her [Gara] tuned up at some point in the future since it looks like a really strong ability, though with lots of micromanagement. Mesa,Titania, Saryn, Volt, Equinox, Excalibur... plenty of absurd DPS to choose from. I still haven't jacked up Volt or Excalibur. All I really want from Volt is speed, and I picked Excal as my starter way back and kinda burned out on it before I got any of the mods that would make it strong. That sounds very cool. I'm still at the Dessication and melee stage. But yeah, Negation Swarm is very nice and made today's radiation sortie stages not bad at all. I get tired of mostly just bringing Oberon to those. Inaros is also a great pet frame. Link Health, Link Armor, and Pack Leader make a pet stupidly survivable with Inaros. Yeah, I gave in and built the Nutrio segment on Sunday since I've been playing Oberon and Inaros most of the time anyway. The problem with affinity boosters for the daily reward is I want to squeeze every last benefit out of it so last night I ended up blowing probably 10+ forma on frames and weapons. So now all those extra forma from the plaguestar event are gone and it comes around every month, right? Yeah, they offered me a 5-hour credit thing last night, and I could use it for the final jump for Cephalon Suda status among other things, but I also wanted to sleep so I took some Cryotic instead. Some kind of fire-when-ready toggle on the short-time ones would be welcome. Did something similar a few nights ago. Spent way too much time in sanctuary onslaught but wound up with a Saryn Prime setup I'm happy with so I was fine. Also leveled up Hydroid Prime but didn't use any forma on him. Then last night the sortie coughs up a 3 day affinity booster. The trick with login boosters is to be high enough MR that you get 32 hours. Universal Vacuum you say? Is this in the game or just announced? Announced to come with Fortuna. Vacuum mod for pets basically. Is Fortuna the next patch/frame release? It's the next big update which will implement the Venus open world, a new Warframe (Garuda), and a bunch of other new stuff. I'm thankfully sitting just under 20 forma still from all my Plague Star farming. Have nearly finished leveling Chroma Prime and have my Vasto Prime all forma'd for my riven. I think I might be able to get a better roll for it but it seems passable for now. And it's coming (The plan is anyway) in the first week of november. I'd say it's on schedule for that, with the ARG they're ramping up right now. 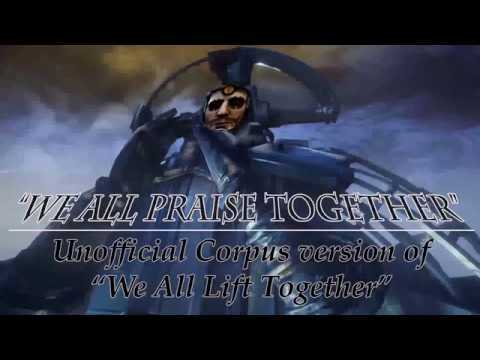 if you enter SOLARISUNITED as a promo code on the warframe site (under store>promo codes) you get a free lift together sigil. 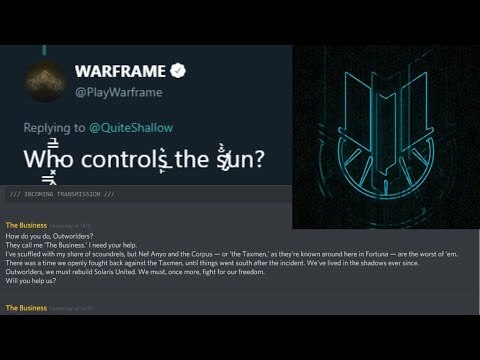 it's a part of some ARG that i guess they are doing with "warframe partners" for whatever reason. Oh my gosh, no way. You mean we'll be able to use our animal pets and pick up loot? Man, I'll be very happy when my controller will work again with the PC version. Here's hoping it's more interesting! I so hope that once Railjack comes out (or earlier) we'll get to crush another Nef Anyo plot. Most Grineer villains have redeeming values. They're raving tinpot dictators, mad scientists etc etc. 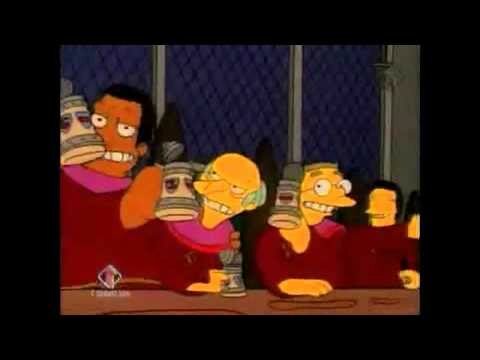 Corpus villainst are just so slimy, simpering...weak. Cocky and toxic as long as they're sure that they have more technology and minions to throw at you, but little begging wretches once you rip away their defenses. Their faces and groins are just so... Kickable. Cool article on the cosmetic Tennogen program and how it helped out one artist. I haven't been playing for that long so I hadn't heard of the program, though I have seen the items for sale, just never bothered to look into why some is available for plat and others for Steam cash. aw damnit, that song is ridiculously catchy and is gonna be bouncing around my skull for another week. it was funny tho. i got all the khora parts after playing so much sanc onslaught that i was losing hope. i wish for a day when RNG in games is replaced with something that makes it so i'm happy i got whatever thing i'm after instead of just relieved that i don't have to do that thing any more. also have chrome prime and the gram prime building, still looking for the rubico prime bp. been a pretty good week! i've cracked sooo many relics, you guys! i'm thinking octavia is next. just need the derelict survival mission for the last part.